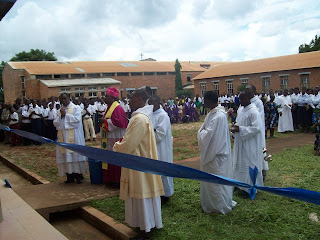 In the photos the archbishop at the site blessing the new dormitory building. Below the archbishop cuts a ribbon at the inauguration ceremony. 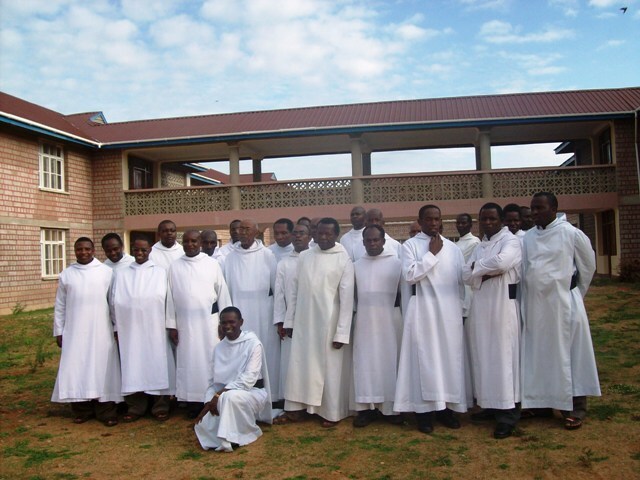 On January 6th, 2011 in the Archidiocese of Songea (in Southern Tanzania where Hanga abbey is located) were ordained eight men to deaconate to be ordained priests sometime after June this year. Among the eight men was also a native of Hanga village Mr. Gaston Milinga. His early childhood was very much influenced by Br. Agustino Mgedzi, the monk of Hanga Abbey. 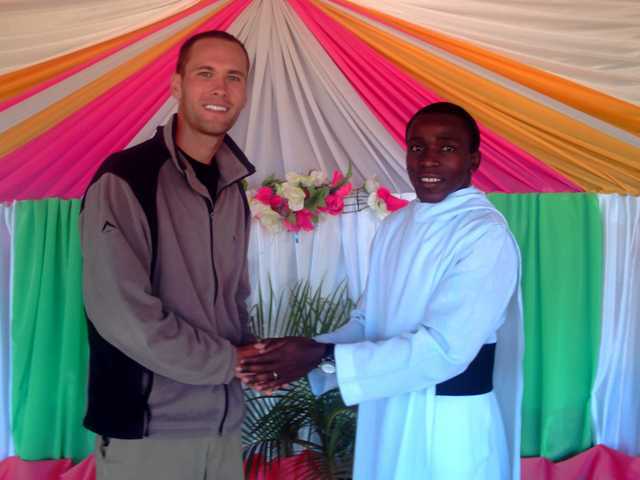 Congratulations to Deacon Gaston and we are looking forward to his ordination to priesthood. 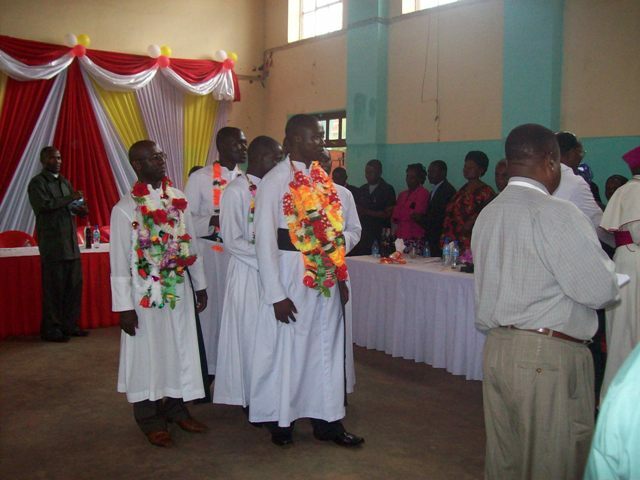 In the photos: above deacon Gaston Ngonyani (center) with other deacons after ordination mass at Songea. Below from left Abbot Thadei (of Hanga Abbey), deacon Gaston, Br. Agustiono, Fr. 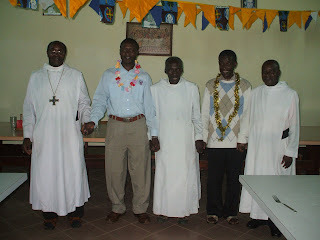 Elias Chale (pastor of Hanga parish), and Prior Odo Nanyanje at the abbey when the monks had dinner to congratulate deacon Gaston Milinga. It is a matter of fact that no man is an island. Even the person you might think is the most hated person he/she has friends. Hanga Abbey bosts itself of the constant visits of guests from and outside the country. Our foreign visitors come to experience Tanzanian cultural life and have fun with a family in the village of Hanga for a day or two and site seeing especially our National Parks (Ruaha, Mikumi, Ngorongoro and Serengeti). 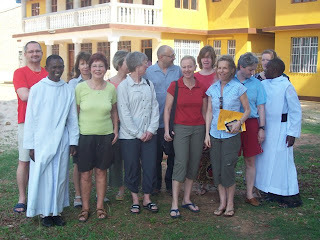 We are happy to present to you some groups and persons that visited Hanga Abbey this past year. As you look at the pictures and learn what they were there for know that you too are welcome to visit the abbey. From Oregon Institute of Technology - Oregon (USA) there was a group of five people: two professors (Mr. Mike Cornachione and Mr. David Thaemat) and three students of engineering. They were at Hanga in June for two weeks. Their business was humanitarian and professional. They brought salvation to Mputa village north of Hanga Abbey. 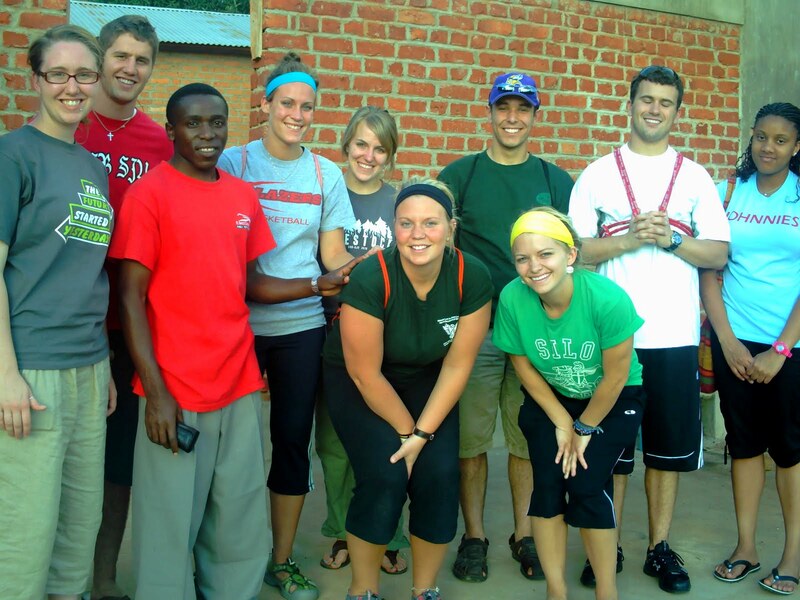 The group installed three new water hand pumps through the funds they raised in the US. We thank them whole heartedly that now the villagers have access to safe drinking water. They will be returning to Hanga this year 2011 for the same work of helping people to get safe drinking water. In the photo sitting from left is Dr. Mike and Dr. David Thaemert standing left behind with the group that visited Hanga Abbey and Mputa villages. 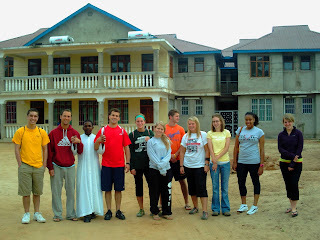 In June Paul Conroy brought a group of students from St. John's University in Minesota (USA). 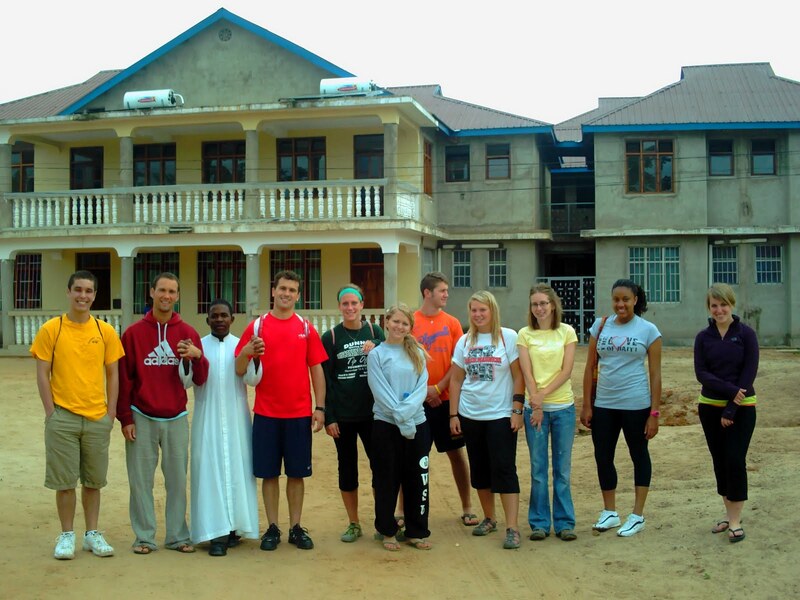 He has been bringing students from the uninversity since he left Hanga (2007) after living there and teaching at the abbey schools and delving himself deep into Tanzanian culture. He lived in remotest areas you couldn't think, even by Tanzanian standards! Thank God he did not get jeagers!! In the above picture Mr. Paul Conroy poses a picture with Br. Stanislaus at the altar in the tent during the celebration of ordination. 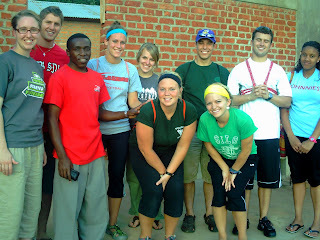 Right and below are pictures of the group from St. John's University. From Austria Miss Petra Gehrer brings visitors to Hanga Abbey tree times a year. Her group sees National Parks, gets experience with Tanzanian families, goes to Lake Nyasa in southern Tanzania, visits Zanzibar and other National Parks. Her last group last year was in December when they had the opportunity to celebrate Christmas with the monks at the abbey. 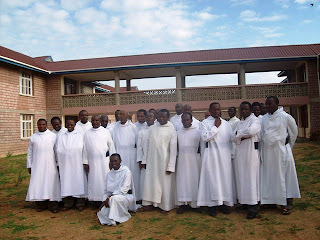 Word has it that the midnight Chrismas mass was so long and our guests had to leave earlier. I would too - three hours mass! !